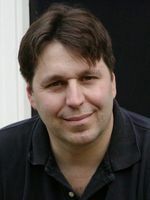 R. A. Salvatore is the New York Times best-selling author of the DemonWars trilogy and many of the Forgotton Realms novels, including the popular Legend of Drizzt series. He also wrote the first novel in the Star Wars: The New Jedi Order series called Vector Prime, as well as Star Wars episode 2: Attack of the Clones. With over 10 million books sold, R. A. Salvatore is one of the most popular fantasy authors in the world. Matthew Peterson: My next guest is R. A. Salvatore, New York Times bestselling author of the DemonWars trilogy and many of the Forgotten Realms novels, including the popular Legend of Drizzt series. He also wrote the first novel in the Star Wars: The New Jedi Order series called Vector Prime, as well as episode 2 of Star Wars: Attack of the Clones. He’s sold over 10 million books worldwide. Thanks for being on the show today, Bob. R. A. Salvatore: Good to be here. R. A. Salvatore: I remember it well. Matthew Peterson: Yeah. I spent many, many hours as a kid playing that game. R. A. Salvatore: That was based on the Jim Ward book. Matthew Peterson: Yeah, and I didn’t realize that it was based on a book until years later. Someone’s reading this book and I look over there and it’s Pool of Radiance. And so that was my first introduction of the books for Forgotten Realms. So, I was wondering, how did you get involved with the Forgotten Realms series? R. A. Salvatore: They weren’t even out yet. The only thing that they even had printed was Doug Niles’ first book. Now, I knew TSR, I knew the Dragonlance books, obviously. R. A. Salvatore: And I was a D&D player, had been for years. So, when they showed me this world, I auditioned for the second book and the rest is history, I guess, now. Matthew Peterson: What gave you the idea of creating this Drizzt character? He’s a very unique character. R. A. Salvatore: Actually happened off the top of my head. When I told you the book they sent me was Doug Niles’ Darkwalker on Moonshae. And the map in that book only showed the Moonshae Isles. So, I thought that was the Forgotten Realms and they’re really tiny little islands. R. A. Salvatore: And she said, “Can you spell it?” And I said, “Nope.” And I don’t know where it came from. It just happened. Just like that. Matthew Peterson: It just came. Just like lightning. R. A. Salvatore: Very good lightning. Matthew Peterson: Are you going to continue writing more in that series? R. A. Salvatore: Well, I’m writing the next one now. So, that answers that. R. A. Salvatore: This is the last book on my contract, the one I’m writing now, but we’re in negotiations for another contract. I don’t expect to be done with him anytime soon. But as long as I’m enjoying writing him, and as long as people want to read him, why wouldn’t I write him? R. A. Salvatore: And people seem to want to read ‘em. And I’m having a blast writing ‘em. So, what the heck? Matthew Peterson: Well, he’s not your typical dark elf, kind of goes his own way, very different than the stereotypical person. R. A. Salvatore: Which makes him kind of the classic outcast hero. Matthew Peterson: Yeah. So another series that you’ve written is the Demon Wars. Explain your magical system in the DemonWars. R. A. Salvatore: Well, in our own history, I’ve always been very interested in the role the church played in European history in particular. And so what I’ve set up in DemonWars is I use gemstones. And really the church has the secrets to the gemstones and that’s their power. And, well, really through all seven of the books, the big conflict is, much like the schism that affected the Catholic church, in the middle ages, over wealth. We have one faction saying we’re supposed to be poor and share the money with the people and the other faction’s saying, no we’re supposed to build these towering cathedrals to God. Only with these guys, the fight is over the gemstones, where you have one faction saying, you know, these gemstones can do beneficial things for people, you know, every village should have access to them. And then the other one saying, no these are the gifts of God and we’re the voice of God. So, we control them. R. A. Salvatore: [laughs] I know. Matthew Peterson: I say lucky in a facetious way. There was a decision made to kill off one of the main four characters of Star Wars. I won’t mention who it is, ‘cause it was a total shock. R. A. Salvatore: Everybody knows who it is. Matthew Peterson: [laughs] Yes. There was a big backlash. I hear there was even some death threats. R. A. Salvatore: Tremendous backlash. Uh, yeah. Yeah, absolutely. R. A. Salvatore: And I was like, “You’re out of your mind. I’m not doing that.” And we went through this long process of them trying to convince me that they were doing this for the right reasons and that we really should do this. And eventually they--actually I think it was Mike himself, who convinced me. They temporarily convinced me, ‘cause after I’ve seen the reaction, I think that might be the one thing, if I could go back and change something in my career, I think that might be it. R. A. Salvatore: Well, that’s okay because I’m the one that recommended, well, me and one other person, recommended Troy Denning for the Star Wars Universe and then he came in and they made him kill a major character. And he got all kinds of grief for that. And he called me up and he’s like, “Hey thanks for uh . . . thanks Bob, you know.” And it’s like . . . [laughs] Now, I went to ComiCon a few years ago and I was with Crossgen and we were walking down the street going to lunch with Crossgen Comics, now de-funked Crossgen Comics, unfortunately. And we were walking down the street going to dinner and they had a couple of guests with them, and they introduced me to the guy who killed Superman. R. A. Salvatore: They introduced me as the guy who killed so-and-so. So, we were walking down the streets of San Diego looking for snipers on the roof. It’s pretty funny. Matthew Peterson: I’m sure, I’m sure. Obviously, you got a lot of attention from that. There was a lot of backlash, but on a good note, you were chosen to write the second novel in the Star Wars series: The Attack of the Clones. R. A. Salvatore: Yeah, the novelization. Matthew Peterson: The novelization. What was your experience with writing that? R. A. Salvatore: Ah, that was an absolute blast. I flew out to Lucas Film the day of the 2000 election. So, I get up to Marin and they gave me the script and I had to go to my hotel room and read the script overnight because I was meeting with George the next day. And so I was sitting in my hotel room reading the original script for Attack of the Clones and every time I finished a scene, I’d glance back at the TV and we had a different president. Remember that election? R. A. Salvatore: And that went through the whole night. So, the next day I was up at the ranch and I’m supposed to get 45 minutes with George Lucas, but we hit it off pretty well and four hours later we were still going strong. It was a wonderful day. R. A. Salvatore: And then I went back up there a couple of times. The only really bad moment . . because what happened was, I went and did the book, and then I added a bunch of stuff to the book that wasn’t in the script. And then I had to re-write a lot of that because I didn’t realize that the entire movie takes place in three days, that really shocked me when I heard that. R. A. Salvatore: I mean, I had all that. I had all the stuff in there, except for the big battle that was going on around it, ‘cause none of that was supposed to be in there. Matthew Peterson: [laughs] Well, you know, books take a long time, They have to go to the publisher, they have to be edited, they have to . . .
R. A. Salvatore: Well, this one had to be translated as well. Matthew Peterson: . . . translated, and they want the book to coincide with the movie. Matthew Peterson: But that’s a fun experience, though. ‘Cause there’s lot of Star Wars books, but there’s very few novelizations of the movies, there’s only six movies, so that’s kind of an exciting thing. R. A. Salvatore: Oh, it’s very cool. I got to work with George Lucas. R. A. Salvatore: I’ve seen him a couple of times. I mean we were up there a bunch of times. And the people around him are great. I had a blast working with Lucas Film. I really did. You know, I regret what happened in Vector Prime a little bit--sometimes I do, sometimes I don’t, but usually I do. But I don’t regret working with Lucas Film at all. I had a great time with them. Had a wonderful adventure in a galaxy far, far away. And Skywalker Ranch is absolutely amazing. Matthew Peterson: Well, I can only imagine. I’ve heard a lot about it. R. A. Salvatore: It’s amazing. Matthew Peterson: Well, Bob, I really have enjoyed speaking with you. I’ve been speaking with R. A. Salvatore, New York Times bestselling author of the DemonWars, Forgotton Realms, and Star Wars books . . . The person who killed the so-and-so character in Star Wars. [laughs] Thank you so much for being on the show, Bob. R. A. Salvatore: Great to be here. Matthew Peterson: Yep, yep. Well, that’s fun. Well, have a great day, Bob. R. A. Salvatore: Take care. Matthew Peterson: Alright everyone, go to www.TheAuthorHour.com after the show, and you can listen to a lot of the extra stuff that was cut out from the interview. There’s a lot of good stuff there. Coming up after the commercial break is Brandon Sanderson, the lucky author who was chosen to complete the late Robert Jordan’s Wheel of Time series. Don’t go away!